How did my recent trip to Cairns go? It was fantastic to catch up with my beautiful daughters, to take them to the movies (I love the movies – I watched 6 in total. Two on the plane over, two while in Cairns and another two on the return journey), to go to a magic restaurant at Palm Cove and to have a lamb roast with the family and friends….sort of! 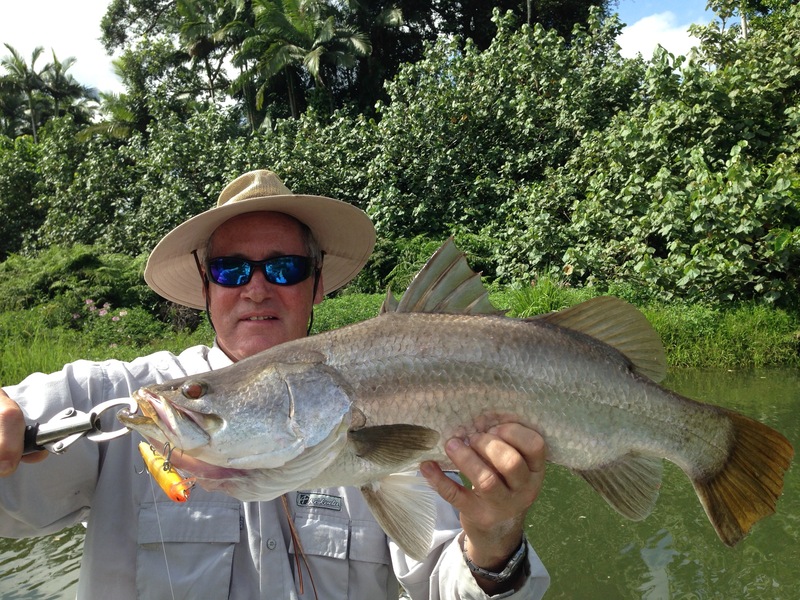 Monday – Daintree – it was a pleasure to go with a guide. Will from Fish Hunter is a good guy and I certainly have no problem recommending him to potential clients and have conveyed that to Pam (Fishing Cairns). I would love to fish with him again. Tuesday – Russell – it was a dog of a day. Fished with Brett. We went a fair way upstream and did the sooty drift. We saw hundreds of fish, darting out from the logs, bankside and weeds – but they just wouldn’t hit our offerings. We tried poppers, SR5’s, minnows etc. I only caught 2 fish for the day while Brett landed 6. Wednesday – Russell – After much deliberation and consideration of the tides and potential for rain, we reluctantly decided to go back to the Russell. Mainly because that shallow patch above the Innisfail township would have meant that either a very early exit of around noon, or a very late return after 5pm would have been on the cards if we fished the Johnstone. And I had commitments for dinner at Palm Cove at 6.30pm. Upon launching at Bellenden Kerr it was obvious that they must have had a fair bit of rain overnight down that way. The river was noticeably higher and a bit discoloured – not dirty, but the colour of weak coffee. The previous day the water was gin clear! We were able to motor right up under the highway bridge – quite a rare feat I might add, and start our drift. We both hooked on poppers and immediately we were having success. My first fish was a lovely little (very little) trevally, then came the sooties and every now and again that bright silver flash from a tarpon excited us. 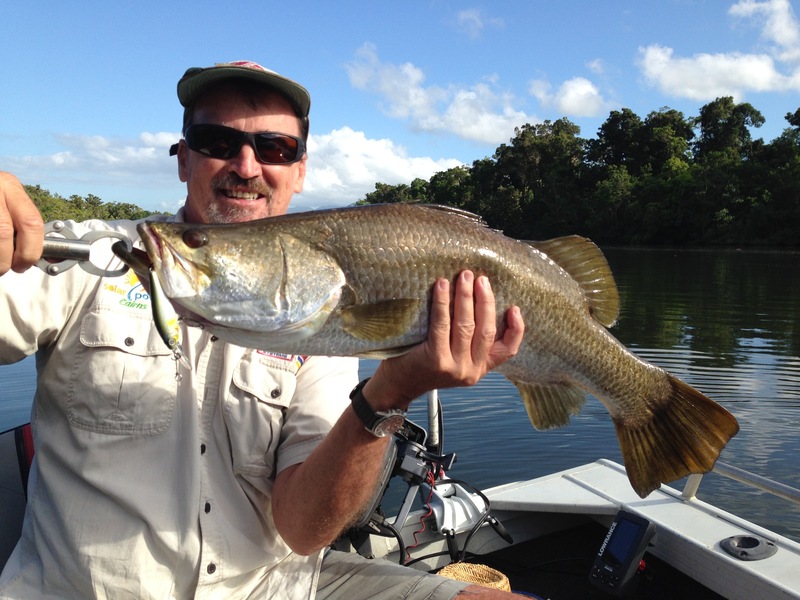 At the mouth of Eubenangee swamp I was smashed by a feisty little barra…whoo hoo! By lunch we had landed 20 fish….we were stoked. And after lunch, the hits kept coming. I decided to experiment a little and clipped on that little gold / black bomber 6cm shallow lure and was instantly rewarded….again and again. I gave it to Brett as he was so impressed. And the tally for the day was a very respectable 43 fish….WHAT A DIFFERENCE A DAY MAKES! 1. There was a rain event overnight which made the river rise a foot or so – just enough to traverse higher upstream. 2. The water clarity – this I believe was the crucial factor. Monday’s water was too clear – if that’s possible? As they say, “If you can see the fish, then they can see you” These fish live in their river and are very aware of what’s happening in their environment. They can probably see / feel your presence bobbing downstream way before you arrive at the casting location. On Wednesday we hardly saw a fish before they struck our lures – they were actively hunting food today. There you have it…did I enjoy it? I love our tropical rivers, and just being there is amazing. It does wonders for your soul …being amongst the green, the rainforest, the grass, the water…and dodging crocs too is thrilling. I LOVE IT! Hold on Keith, Will & Brett…I’m already planning my next trip.